Urbanized's Failure to Rightly Account for the Suburbs? When the final 2010 Census came in, it made clear that we're not walking away from our lawn tractors and two-car garages anytime soon. An analysis of eight metro areas, including Chicago, Washington, D.C., and Austin revealed that in the past decade, 96 percent of the population growth occurred in the suburbs. Some took great exception to this analysis, but Brookings' Frey laterconfided, "The sad truth of the matter is that there's really very little information on this back-to-the-city thing, at least from a demographic standpoint." No doubt this would benefit from some nuancing, but it doesn't change my passion for the city in the least. Nor does it change my conviction that the proportional absence of Christians in the urban cores everywhere should lead Christians to move into the city, despite what demographics are saying (or not saying). Either way, I can't wait to see the film! "As the credits rolled, I had to fight off tears." 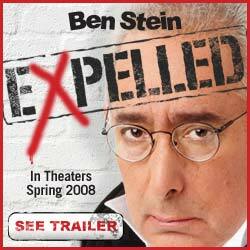 A friend just sent me the link to Ben Stein: Expelled, a forthcoming documentary that deals with intelligent design and chronicles Ben Stein's "confrontation with the widespread suppression and entrenched discrimination that is spreading in our institutions, laboratories and most importantly, in our classrooms, and that is doing irreparable harm to some of the world’s top scientists, educators, and thinkers" (source). The Expelled Blog has been around since August (read Stein's introductory post), so this may have been discussed ad nauseam in the blog world. But if there are others who, like me, have taken a joyful and extended holiday from the blogs, I thought it would be worth linking again here. Stein approaches the issue based on the fact that a free and progressive society should have the freedom to discuss intelligent design without fear of discrimination and persecution. 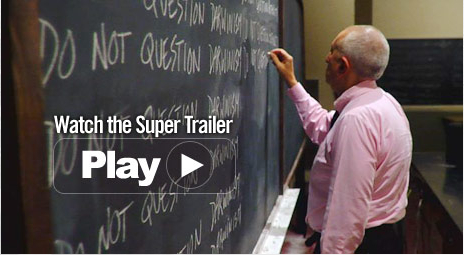 The Expelled site has several videos, including a lengthy 'super trailer' (pictured above). Check them out here, or view the teaser trailer @ youtube embedded below. As personal note, this documentary is especially interesting to me given that the Fellowship Associates residents just finished reading and discussing Nancy Pearcey's, Total Truth: Liberating Christianity from Its Cultural Captivity (Study Guide Edition). 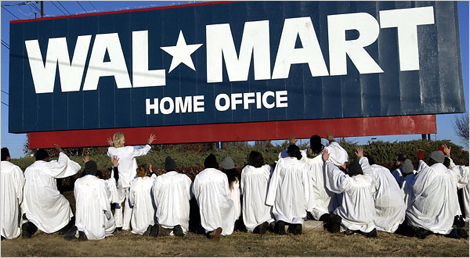 If you're not already familiar with What Would Jesus Buy?, the new film by Morgan Spurlock (writer and director of Super Size Me), you might want to check out the film's official website. The “wall of separation” is a metaphor deeply embedded in the American consciousness, and an idea that continues to cause deep controversy within the country. In this historical documentary, Godawa takes a look at what the Founding Fathers intended when they framed the Constitution and wrote the First Amendment religion clauses. Were they trying to create a Christian nation, a secular paradise, or something in between? 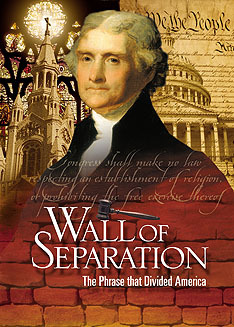 An examination of the humble origins of the “wall of separation” in Thomas Jefferson’s 1802 letter to the Danbury Baptists reveals a meaning quite different from the modern understanding, yet one that foreshadowed the ongoing debate of today. The documentary takes a look at how our understanding of church and state relations has changed through history by means of Supreme Court decisions and cultural pressures. From Everson vs. Board of Education to the most recent decisions over Ten Commandments displays, such interpretations are explored in comparison with the Founder’s original intent. This raises questions: Should "original intent" guide modern interpretation? Should government be secular, or should religion have influence on the State? There are no easy answers to this ongoing debate that polarizes the nation. (see also PBS pressroom). The Chief Ways We Experience Community?